Rebicyclist – Riding Bikes & Making Things: Kicking it up a notch! 29 November 2009Kicking it up a notch! 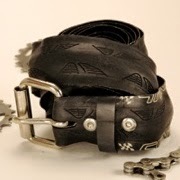 I've been thinking about documenting my whole experience with selling and creating belts and other bicycle themed art for a while now. It seems that now is the perfect time, I am unemployed, in a new town, and almost certain I'll be taking this to the next level. 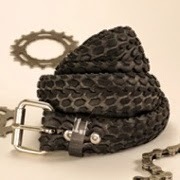 I originally saw the idea for the belts online somewhere, it is not an original idea! I wanted one (a lot actually) for myself and starting gathering supplies. I found some cheap belt buckles online as well as chicago screws. The tires and tubes were easy to come by as I was gainfully employed at a bike shop at the time. I finally got one together and loved it so much I immediately got several more assembled. I quickly realized I had no use for a dozen belts and with some pressure from friends put some on my Etsy site just to see. This was a couple weeks before Christmas 2007, and I did end up selling a bunch then. This was rather exciting and I would slowly make more whenever I felt like I could use some extra cash. This continued for about a year and a half, I slowly increased production through that time, but never anything really serious. At this point Etsy contacted me about being a featured seller! So over the next couple weeks I focused more on getting a good stock of belts made, but really, nothing could prepare me for what was about to happen. 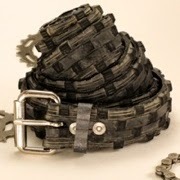 The day the feature went live I sold through all the belts I had listed. I was watching this from work, but knew I had more unlisted stock at home, so at the end of the day I went home and put up some more listings. The next morning they were all gone again so I hurriedly put up some more. This was incredibly awesome but kind of stressful. I think after all this happened I had sold 30-40 belts and had a makeshift backorder list of 70 people (some of whom wanted more than one belt). I had my fiancee, Karen, (now married! yay!) going through and answering conversations for me and managing the backorder list while I sized and packed up belts. I was working on belts for several weeks after this to get all those backorders done (I actually got all those orders out!) and had to ask friends at other bike shops to save tires for me. After this I knew if I tried I could probably do this full time, or at least make a valiant effort. Now I've moved to Portland, OR and think I might actually go down that path. This coming spring I aim to get involved with the Portland Saturday Market, a fantastic craft fair every weekend in downtown Portland. For now I am cranking out belts for my holiday Etsy sales, which I am very happy with so far, January and February are for getting a BIG stock of belts ready for sale and hopefully some other products and art. We'll see how it goes!